Villa dei Fiori is a romantic escape on 14 acres on the boundary of the Joshua Tree National Park. Pine log pergolas cover the surrounding five terraces with arbors of climbing roses and cascades of wisteria. September is the height of the swimming season with the pool temperature around 76 degrees while it is 95 in the afternoon. The nights cool off to the high 70s. Night time temperatures begin to dip in late October, perfect for the hiking season. If you wish to stage, a birthday party, or photo shoot involving a greater number of guests than our 10 - 12 guest vacation rental limit, BEFORE making a reservation request please read the rules below on how to proceed. We no longer host weddings unless they are small. Our large pool surrounded by giant boulders as of June, 2015 is heated to 78 degrees, the perfect temperature for swimming. The swimming season lasts until the first week of October, after which time it begins to cool down due to falling night time temperatures. Depending upon night time temperatures, it sometimes is possible to heat the pool in advance of June. There is a fee of $400 for heating the pool to a higher temperature but is only possible when night time temperatures have risen into the mid to high 60s. It is important to remember that Joshua Tree is high desert, Palm Springs is low desert. Joshua Tree is often 15 degrees cooler than Palm Springs, which means swimming weather comes in late spring, early summer and runs into October. During the winter the large six person Jacuzzi is popular. When summer temperatures rise above 100 degrees, the Jacuzzi is shut down because it can overheat to a dangerous 106 degrees or above. That's when you'll want the pool which will be around 80 degrees all summer. In October, the Jacuzzi is open again for groups up to 8 guests. Above 8 guests, inquire, because it contains only 400 gallons, and we find that above 4 to 6 guests, overuse fouls the water. It is important to wear no skin lotions of any kind to avoid contaminating the filter system. The villa is a extensive renovation of a original historic homestead built in the early 1950s, with 13 French doors leading to five terraces on the North, East, South and West of the house. Villa dei Fiori, means 'House of the Flowers' in Italian, so named because of the climbing roses, jasmine, rosemary, lavender and wisteria growing on five pergolas on each face of the house. In Italian, a 'villa' does not mean a mansion, but rather, a charming country house. Built amid the surrounding quartz monzonite boulders, Villa dei Fiori was created by Dale Allan Pelton, a Hollywood based film production designer and architect. On the west side of the villa, the terraces of 40 rose bushes with a border of purple French lavender and rosemary form a dramatic contrast to the savage landscape of boulders and pool beyond. The estate is six minutes from the West entrance to the Joshua Tree National Park and seven minutes from the East entrance and three minutes to the trail head of the Boy Scout Trail and the spectacular Indian Cove campground with boulder formations that are different that elsewhere in the park. In the attached video drone shot, you will see a grove of Italian Stone pines on the north. To the south, a terrace of raked sand with a Zen aesthetic, is in the midst of large boulders, perfect for al fresco dining. In the west one can see the snow-capped peak of San Gorgonio. Between the kitchen terrace and the southeast terrace stands a giant Joshua tree, several hundred years of age. The motor court is surrounded by mesquite trees and French lavender, allowing a feeling of complete solitude and pastoral peace. Near the house, is a cave formed of giant boulders with a bed of soft sand and a fire pit where guests have dinner parties in the evening by the light of an open fire. Crevices in the boulders open to the sky so that one can glimpse the stars at night. Since Villa dei Fiori is my principal residence, I am selective about to whom I book. I prefer a phone call which allows me to get a better impression of prospective guests, giving me more confidence that they will have respect for a creation that has taken 25 years of hard work. I usually accept only a maximum of 10 guests, on rare occassions, 12 guests. If you are planning to have others on the property for a birthday party, photo or fashion shoot, wedding or other larger occasion, a separate rate and contract must be written. Therefore, an inquiry to set up a visit to the property would be necessary first before making a reservation. Features - The villa has an European ambiance, with three bedrooms, one painted raspberry and another, magenta, and the living and dining rooms treated with hand-rubbed colors of cognac and amber over an under layer of gold. The master bedroom has a romantic antique bed, its ornate design formed with the tendrils of metal leaves. The second bedroom is furnished with a French sleigh bed and the third bedroom opens onto a terrace with outdoor fireplace surrounded by boulders. The living room is equipped with a sofa sleeper beside double French doors opening upon the West terrace. The deep colors of the walls complement the antique Moroccan urns and vivid paintings of the Parisian artist, Michele Viviane Quence. Although the house is modest in size, 1400 sq. foot, there are 1600 sq. foot of terraces with pergolas of cascading wisteria and climbing roses. Each room has its own private terrace, accessed by double doors, 13 glass French doors in total, bring the outdoors inside. Some guests like sleeping on the terraces and even in the large cave with soft sand floor, with carpets available. There is a magnificent library spread throughout several rooms - hundreds of books on subjects as varied as architecture, painting, sculpture, film, biography, literature, photography, fashion, gardening, travel, exotic places, anthropology, history, almost any subject one could think of. The living room features a silk tapestry, original paintings and a rock sculpture from the film, 'Battlestar Galactica.' While there is no cable TV so that one can enjoy the quiet natural sounds of the desert, it is furnished with a DVD and VCR receiver and excellent stereo system with an i pod dock, and extensive selection of CDs and wireless internet connection. Although the kitchen is modest in size, it has top quality cookware, porcelain service for 8, wine glasses, baking ware, all imaginable cooking utensils, blender, coffee bean grinder, oversize toaster, programmable coffee maker, a large micro wave, a new stainless steel 22 cubic foot refrigerator and a library of cookbooks in the living room bookcase. The new LG range oven has double ovens of cobalt blue and over sized BTU burners. The gas barbecue is on the kitchen terrace just 12 feet from the kitchen adjacent to the laundry room. 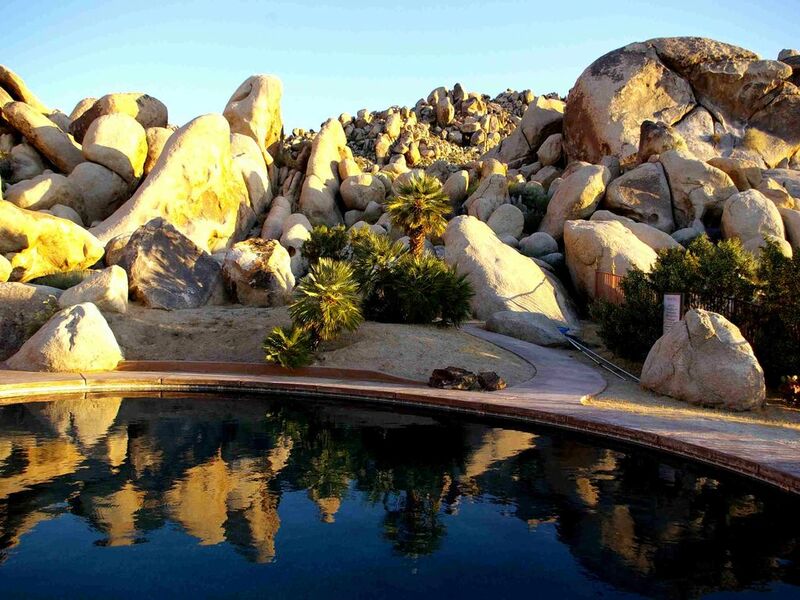 The dining terrace overlooks a Joshua tree amid the boulders. Near the kitchen, there is a fireplace for wood fires on the terrace by the boulders. Since the number of guests vary, numerous tables are set against the wall, so that guests can make their own decision about the size and placement of their dining arrangements. Groups larger than four, require an additional fee per person, with a maximum of 8 guests. During the high swimming season of summer, there are some dates with a 3 day minimum rental, but most dates have only a two day minimum. Major holidays have a three day minimum and a longer minimum stay during spring break, Thanksgiving, Christmas, and the New Year. Although the villa can accommodate 8 guests, we vet these requests carefully, since we have found that in the past, a group of younger persons sometimes fail to take proper care of the big Jacuzzi spa and the house. However, with a proper understanding and a security deposit, larger groups might possibly be considered. There are numerous wooden chairs inside, and 20 chairs on the various terraces, plus 3 adjustable lounge chairs for sunning. In the living/dining room, there is an antique dinning table which seats eight, and 6 crimson leather club chairs. On the south terrace, between the house and the boulders there is an oak coffee table and eight garden chairs. Two reclining chaises are at the pool, with a table and 8 chairs on an elevated terrace overlooking the pool. The large swimming pool has a salt electrolyte purification system and a beautiful gemstone pebble surface. The pool is maintained throughout the year with best swimming months being April to mid October. For an additional charge the pool can be heated, but only through the milder months. The two pool terraces have a table with six lounge chairs and two chaise longes. There is a large market umbrella stored in the middle bedroom closet which may be used at the table above the pool. I attended Cherokee school in Oklahoma with Indians and poor whites. War games and fist fights were the events at lunch time. After feeding the chickens, pulling weeds, fighting prairie fires, I read books in the magical forest across the creek. After wrestling for Oklahoma State and University of Nebraska, I studied philosophy at University of Tulsa, writing newspaper reviews of cinema, literature, essays on ethics and politics. During my college years, I hitchhiked across America, Key West, Florida, New Orleans, San Francisco, through slums of Mexico City, Guatemalan jungles and San Salvadorian barrios, journeys which have inspired the characters in Celine on Fire. Working as a white journalist for Tulsa’s black newspaper, I returned from King’s march from Selma to Montgomery to deliver an address, Thunder in the Ghetto, in the rebuilt Church which had been burned to the ground in the 1921 Race Riot. I organized concerts for jazz musicians, Baby Face Willette and Odetta, opened The Bastille, a folk music, rock/dance club. During two years at the UCLA graduate film school, I directed my thesis, Death of the Red Planet, in 35mm Cinemascope, quadraphonic sound, the first film created by lasers. http://cec.concordia.ca/econtact/11_4/pelton_red_planet.html. filmed in the laboratories of Cal-Tech and sound track created at Cal-Arts. Praised by American Cinematographer, and Hollywood Reporter, the film was invited to the Cannes Festival and played in 600 theaters across America. My first film work was for Battlestar Galactica. While working with Steven Spielberg (The Goonies), Terry Gilliam (Fear and Loathing in Las Vegas), Paul Verhoeven (Hollowman), designing music videos for Olivia Newton, Travolta, Cindy Lauper, I wrote screenplays at night, East of the Moon, and a musical Celine on Fire. From my original screenplay evoking the spirit of Gene Kelly’s An American in Paris, the story evolved into a historical-philosophical novel set in 1950s Paris. I discovered Joshua Tree in 1968 when visiting my family, original settlers who homesteaded the land in the early 1950s. I began landscaping the garden 25 years ago. The Italian Stone pines are 22 years old, the rose garden 15 years ago. The terraces and surrounding berms of decomposed granite have been sculpted over the years. Bighorn sheep often come off the park into our valley of the moon where bobcats, kit foxes and roadrunners roam. Peaceful solitude. Large cavern with two fire pits for dinner parties close to house. Bedding and pillows for extra guests. Barbecue on Kitchen terrace. Giant Joshua Tree in the boulders. Villa dei Fiori's boundary is on the Joshua Tree National Park. Our Valley of the Moon is excellent for bouldering and rock climbing. Large saltwater pool surrounded by boulders and oversized Jacuzzi spa for six. Many windows and 13 glass French doors open to garden and boulder views from every room, the scent of flowers enveloping the house. Villa dei Fiori has a professional chef available to cook for guests at the house. Prices and menus are available upon request. Mountains on the Joshua Tree National Park are adjacent to the property on the South. View of distant mountains and Coyote dry lake to the North. The giant boulder outcroppings of the National Park form a natural hidden valley on the Villa dei Fiori estate. Linens for extra guests are in the antique cedar chest in the Asian room. Ovesize LG washing machine in the laundry room. Key furnished upon request. Oversize LG dryer is in the laundry room, key available upon request. Parking for 8 cars or RV vehicle. Special permission is required for more than 4 or 5 automobiles, or a RV. Two sets of double French opening to two separate terraces with pergola laden with wisteria and climbing roses. Stainless steel refrigerator with glass shelves. New LG range with double ovens. 13,000 BTU burner, infrared grill. The LG stove has a double oven. Stainless steel over size toaster for 4 slice capacity or long pieces of French bread. 25 herbs and spices, sea salt, tea, cooking oil, vinegar, flour, and baking power. Antique Dinning table. Two dining tables on terraces which are moveable to 7 terraces. Surround sound is excellent in the living room. A huge collection of Oscar winning and popular movies available. The library valued at $150,000 covers literature, art, interiors, architecture, gardening, cuisine, wine, history, politics, automobiles, fashion, nature, exotic places, France and Italy. The sound system connects to your iphone or ipod. Extensive collection of contemporary and classic films. One acre of garden, grove of Stone pines and cypress, climbing wisteria on four pergolas, rose terrace with 50 rose bushes French lavender, rosemary, jasmine, Bird of Paradise to cut your own flowers. Seven terraces, one outside each room. There are seven terraces. Each room has glass, double French doors opening upon a private terrace. The pool has two terraces, one with a fireplace surrounded by boulders above the pool. Palm Springs has nearly 100, some world class links, 45 minutes distant. Yucca valley has a golf course 15 minutes distant. 36 ft x 24 foot saltwater pool surrounded by giant boulders close to the cave. 36 x 24 foot custom pool nestled between massive boulders next to wilderness. Pool suitable for swimming from late March to October 1st. Large Library. Seven terraces, two with fireplaces, each with an unique ambiance and view. Magical Property, Gracious Host, Amazing Experience! I spend several weeks in Joshua Tree every year and have to say that Dale's property is one of my absolute favorites. Not only in the home full of books to keep your mind active but the patio areas, views, and surrounding property are exactly what we were looking for in our Joshua Tree experience. The boulder mountains and valleys adjacent to the house offer some of the best hiking and bouldering around. It was so convenient to just walk out the back patio and have access to the large boulder hills and vibrant wildflowers. We spent several hours exploring at sunset behind the house. We even were able to climb up to an amazing cave from which to watch the sunset and view the entire valley! Not only did the property offer us endless entertainment, but Dale was a very accommodating and gracious host. Anything we needed he was happy to provide/advise. In fact, he was even gracious enough to provide jumper cables when one of our vehicles had a dead battery on our final departure day! Dale was kind enough to allow us to spend the afternoon on the patio after checkout as we sorted out our vehicle situation lol. All in all an amazing Joshua Tree experience, in exactly the way we had wished. I highly recommend Dale and his magical property! The perfect retreat and hangout space! Best location imaginable. Nice quaint house, beautiful Pool and the kids loved exploring the rocks and caves just behind the home. Only a few miles from the entrance into the park and the town of Joahua tree. Really cool place! Thank you for an excellent review. I appreciate your appreciation of the house and gardens. I'm glad your kids had a great time. And thank you for taking such good care of the house. We hope you come again, and I'll be here to meet you the next time. Have a great year in 2019! The house was very clean, spacious and well maintained. It met our needs perfectly. Joshua Tree this time of year was beautiful and we had great weather. Thanks John, the review was just posted. I am wishing you and your girls solace in the coming year. Amazing property and awesome Host! Amazing property with plenty of activities and things to explore! Dale was a great host and everything was very clear and he was very responsive. He gave us a nice long tour when we arrived to welcome us. You can tell that he has really spent a lot of time and has put in a lot of love over the years to make this a truly special place. The grounds were so awesome, we only wish it wasn't so cold outside to explore it more (and utilize the pool! ), but we are already considering a return visit in the Spring or Summer. The Hot Tub was nice during the cold evenings, and the cave was great for hanging out with old friends. Thanks for your wonderful hospitality, Dale! Swimming in spring and summer, Wild animal and bird Watching, Cave and wilderness exploring. Astronomy, Star Gazing. Resort town, shops, renown art museum and casinos in nearby Palm Springs. Basic rental rate for two night stay $950 for 2 - 4 guests, excepting special offers, 12 guests are the maximum unless otherwise granted. Midweek can be lower on short notice. Weekly rate is regular $2800 – $3400 holidays. Major holidays and spring break is $595 per night for 4 guests, with a minimum number of nights. Events are subject to discussion. Major holidays like Spring Break, Thanksgiving or Christmas have one week minimum, $3400 - $3800 depending on number of guests. Sometimes a 5 night minimum applies.